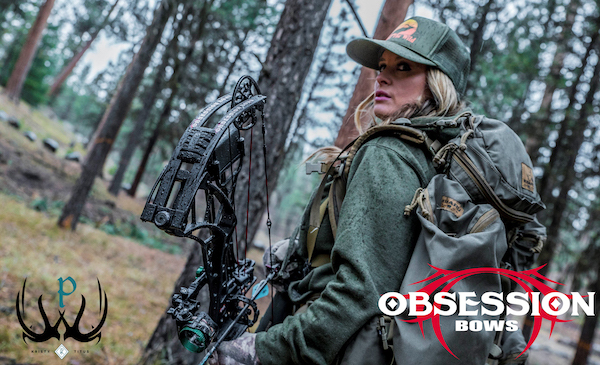 Obsession Bows is excited to announce a multi-year exclusive agreement with professional hunter Kristy Titus and her digital video series, “Pursue The Wild”. The series, viewable on YouTube and Amazon TV, follows Titus on hunting adventures in the backcountry of the West, whitetail pursuits and includes insights on becoming a more efficient hunter, all while promoting the ideals of conservation and public lands stewardship. Obsession Bows joins the Arcus Hunting brands of Ramcat Broadheads, Trophy Taker and Dead Down Wind as sponsors of Pursue The Wild. “Kristy is a remarkable storyteller and presents our lineup of scent control and archery products in a way that complements the adventure while showcasing how they contribute to her success,” says Chip Hunnicutt, Director of Marketing for Arcus Hunting. Pursue The Wild recently had the film “Moments” selected for the prestigious 2018 Full Draw Film Tour. The feature follows Titus to Missouri for a dramatic whitetail deer hunt, expertly capturing the anxieties and joys of bowhunting. “Kristy’s digital series is a great vehicle for our brands and we are excited about the exposure they’ll get through her selection for the Full Draw Film Tour,” added Hunnicutt.